As a small note, the trunk shown is almost below the minimum size, you should start with 25+ cm trunk, but these were small workshop axes not intended for heavy hitting. 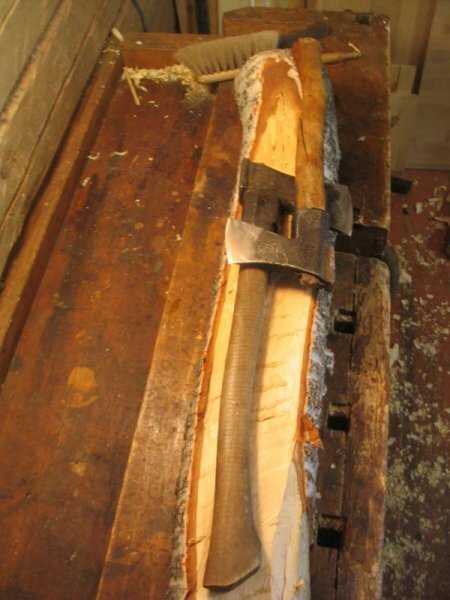 The trunk was already chopped flat with an axe, the rest of it came with bow saws. Ohyes, they look crude, but one of these days I'll do something about it. Talk about "user tools", these are users if anything. By the way, never take the blank from the end of the trunk as there are always cracks over there. Much more than in a plank, as a trunk is dried with the bark on and the ends crack much further. 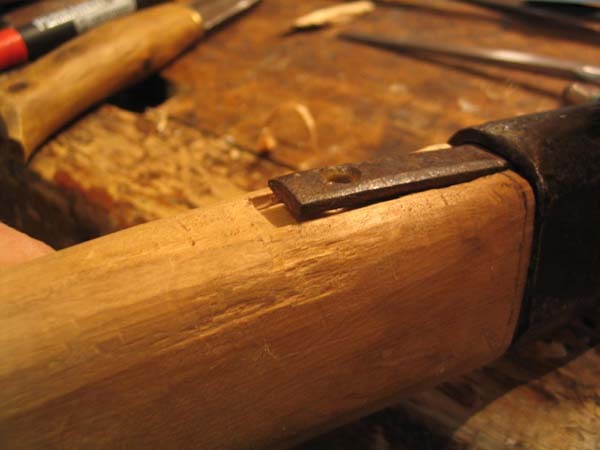 Of course you could make the handle from a plank as well, but it's just not the right way. 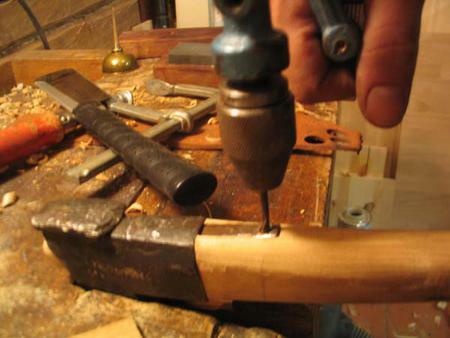 Fitting the end is just the same as on a hammer. 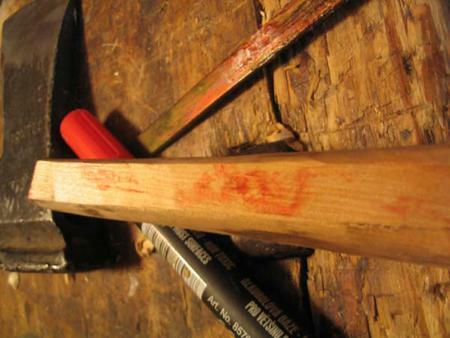 I smeared some soot to the "eye" of the axe to be able to see the high spots on the handle. As you saw, fitting of the handle was done with only preliminary form of the handle showing. Getting the axe head on just right is delicate business and if you get it a bit wrong you can still adjust the angle or twist a wee bit if the handle isn't completely finished at this stage. 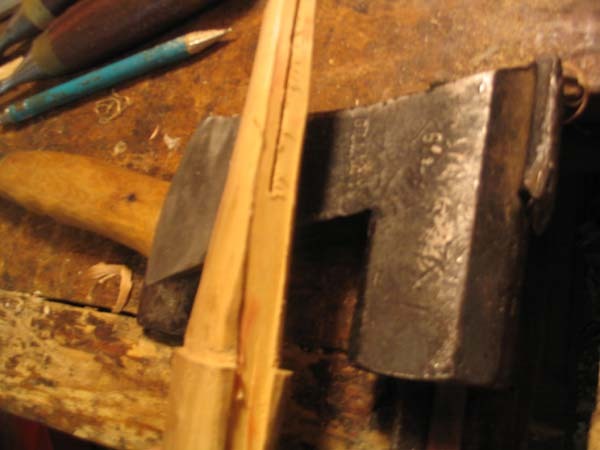 Unlike almost all Finnish axes, this one was fitted with two hooks keeping the head on place. 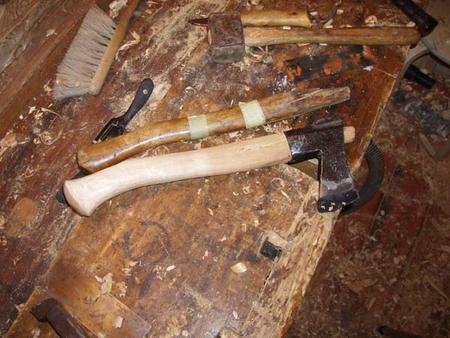 They were fitted just as fitting the axe head, with colour. Only that I used red felt-tip pen to colour the hooks, soot would have dirtied the whole handle. 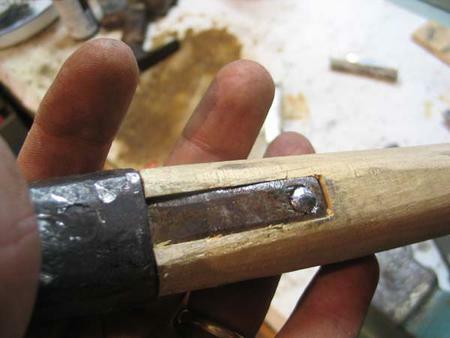 Wedging is just the same as on a hammer head, here was just the addition of rivetting the hooks on. 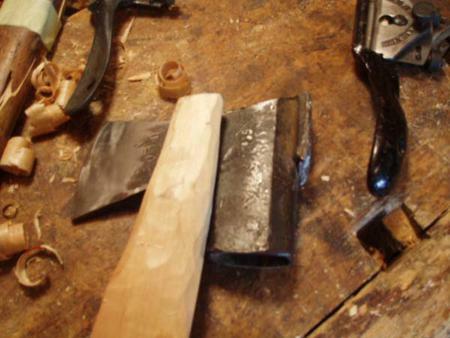 On the first picture there is the old handle and un-finished new one. As you notice, I am a bit shy on making the final cuts on the blank, so there is at least 3-5 mm extra on every side. On the second, finished picture you can see the handle finished and tarred. 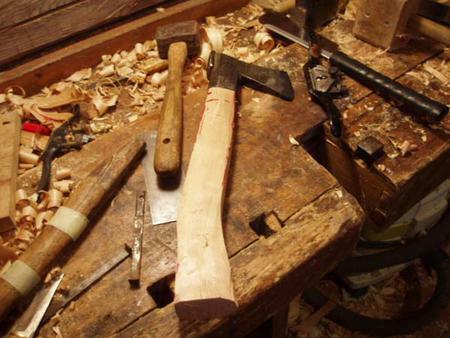 An axe is practically the second most important tool on Finnish woodworking tradition, straight after the puukko (knife). 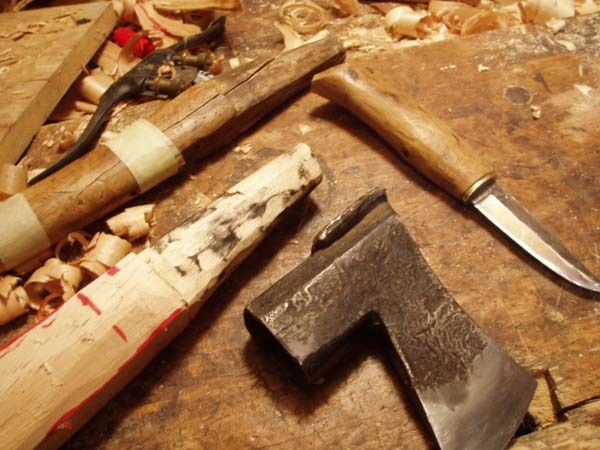 A good axe is kept just as sharp as a knife. 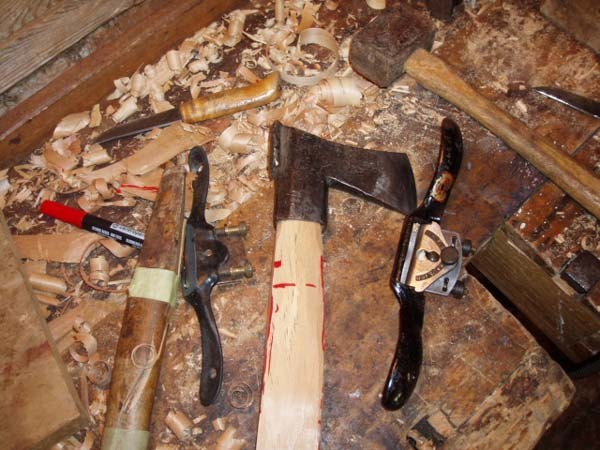 On the countryside a man would have built his own house from logs till the 1930's with just an axe and a saw. Even the delicate joints on corners were mainly done with just an axe. No framing chisels, no slicks, no nothing. We are pretty primitive people anyway. 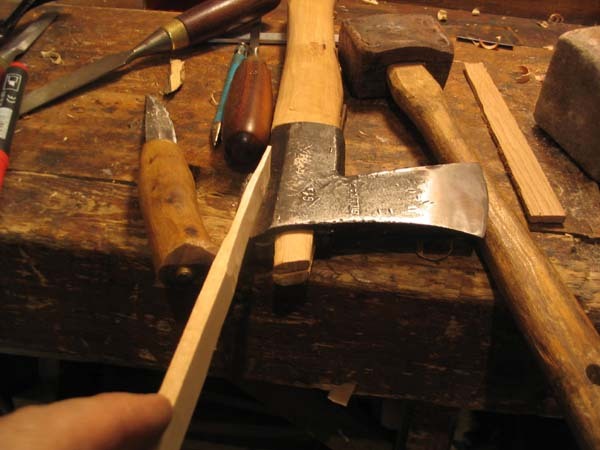 To return to the issue of "which side up" or what grain direction to use, there are some rules on using the wood that are almost genetic around here. The skis are always done with the bottom of the ski towards the bark and you ski with top end of the tree back. When putting a plank to the facade of a house it's always "inside out and topside down", heartwood out and top down. 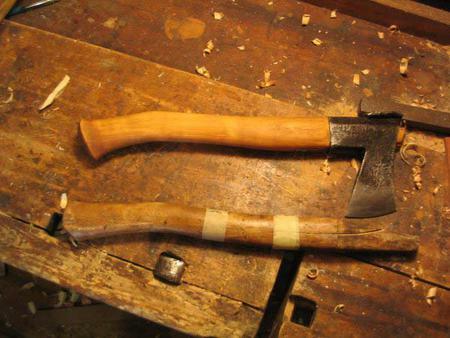 Making an axe handle with the back of the handle from the center of the tree would really feel like walking with your shoes on wrong feet. I can not thell why it's that way but I just can't twist my mind enough to do it the wrong way. 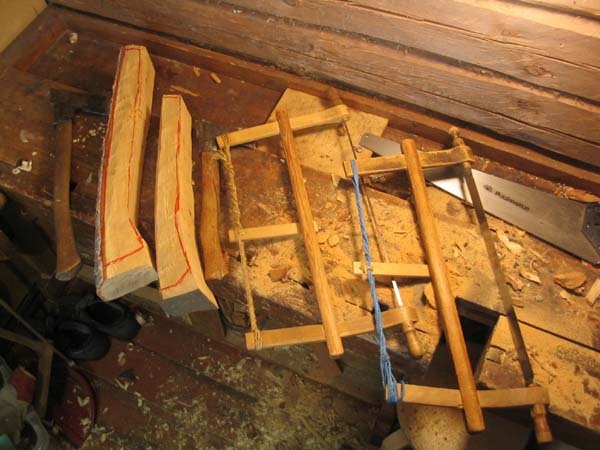 This is just my intuitive guess why: Sapwood is more elastic than heartwood. Back side of the handle is pressure side and the more elastic sapwood will compress a bit more when hitting than heartwood would if it was on the backside. This gives a bit of flex to the handle to prevent it "kicking back" when you use the axe for splitting or other heavy hitting. Factory handles do this a lot as the grain orientation is whatever the machine produced. 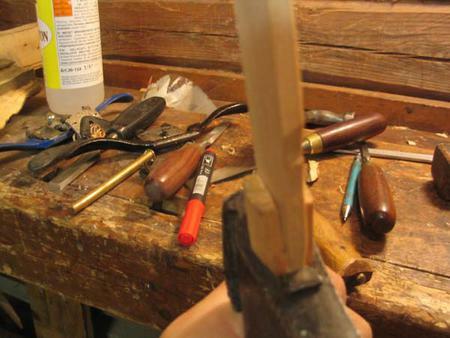 Also, if you put the sapwood on the tension side (front of the handle) and the rigid heartwood on back youl have too much tension on the sapwood. As wood stands pressure very well but doen't like tension, you'll have a handle that might be prone to splitting on the front side if you do it backwards. So getting the grain dierction right you'll get both a handle that's "nice to your hands" and not too prone of splitting.